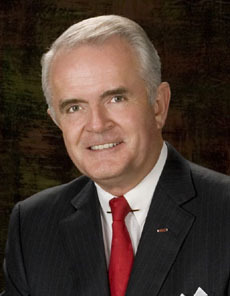 Attorney, pilot, and state legislator elected to five terms in US Congress beginning in 1997, succeeding Barbara F. Vucanovich. Conservative Republican; generally anti-abortion rights, anti-gay rights, pro-gun rights. Supported 1998-99 Clinton impeachment, 2001 USA PATRIOT Act, 2002 Iraq War resolution, 2004 restriction to bankruptcy rules, 2005 Central American Free Trade Agreement (CAFTA), 2006 Secure Fence Act. Opposed 1997 Kyoto Protocol to address climate change. Resigned Congressional seat after being elected Governor in 2006, succeeding Kenny Guinn and succeeded in Congress by Dean Heller. As Governor of Nevada, supported the proposed Yucca Mountain nuclear waste site, which is highly controversial in the state. Also embroiled in several concurrent scandals and a messy divorce, in which his wife accused him of having at least two mistresses. In a 2010 lawsuit over Gibbons' alleged groping of a cocktail waitress, the Governor's legal response mentioned that there had been "no intimacy with his wife or any other woman since 1995". Succeeded by Brian Sandoval, who defeated Gibbons in the 2010 Republican Party primary election.